Cowdenbeath keeper Grant Adam saves from Leighton McIntosh. 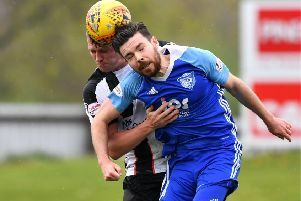 Peterhead’s unbeaten run finally came to an end at the weekend as they lost 1-0 to bottom side Cowdenbeath in wild conditions at Balmoor. Peterhead were well off the pace for most of the game and their display was disappointing. Speaking after the game, manager Jim McInally said: “It wasn’t a normal game and the wind totally affected it. “We lost a poor goal because of a mis-kick and the boy was put through. “It’s hard chasing to get back into the game in these conditions and maybe we had too many forward players on the pitch towards the end. “We missed Simon Ferry as he brings the ball down and keeps it moving for us but we never really created enough. “Our goalie has gone through the whole game without having to make a save but their keeper made a magnificent save from Rory but we needed to get a goal and try and bring them out. “They are fighting for their lives and these things happen. “We need to keep pushing on though and that is what I told the players, we want to finish second and that is our aim. “Once we get the cup final out of the way we can focus on the play-offs as that is our priority,” he added. With Dunfermline now confirmed as champions, Peterhead currently occupy second spot on 59 points with Ayr four points behind on 55 with a game in hand. The win on Saturday gave Cowdenbeath a lifeline as they now move two points clear of Brechin and Forfar who are on 30 points at the bottom of the table. But boss McInally knows it won’t be an easy end to the season. “If you look at our fixtures til the end of the season we arre facing teams who are eighter going for the play-offs or fighting for their safety. “There is something riding on every game we play now and that’s the way it should be,” he added. Peterhead now face a trip to Forfar Athletic on Saturday - a game which will be a tough one as Forfar fight to remain in the First Division.